@kronbits, did you drop the linux support ? I guess I would be fine with a build of 1.54 either way, but the purchase page only mentioned 1.55+ so hesitant to buy. Due some problems and refunds for some people the linux version not works correctly, for others ok, so as no idea of what caused i end the linux version releases. This tool looks so cool. Just purchased and have two issues I would love fixed (or to find out what I'm doing incorrectly...). You always export at 1:1. All depends of pixelation you set. If you have a 4 pixelations for H/w and the image is 512x512, the exported image will be 128x128, due 512/4= 128. So exports at 1:1 to be ready to use, in games or whatever, so you not need to resize, that all people requested so i made in this way. And yes to zoom only works with mouse wheel sorry. Whats the problem? . You tested in WIndow and Fullscreen mode? Press "F" to go to fullscreen and try to export. If the problem is related to the size(MB) and when you try to save the pic the word "download" appears in the name is due chrome is limited a 1.5mb per image. To avoid this use the "Batch export" just load the unique image you want to avoid this chromium limitation. If not one of this cases, please attach a screenshot or a link to some video or how to reproduce the error/bug. No idea about batch limit, maybe none, i tested with around 60 files and worked, just needs time. Does this version fetaure the color picker? 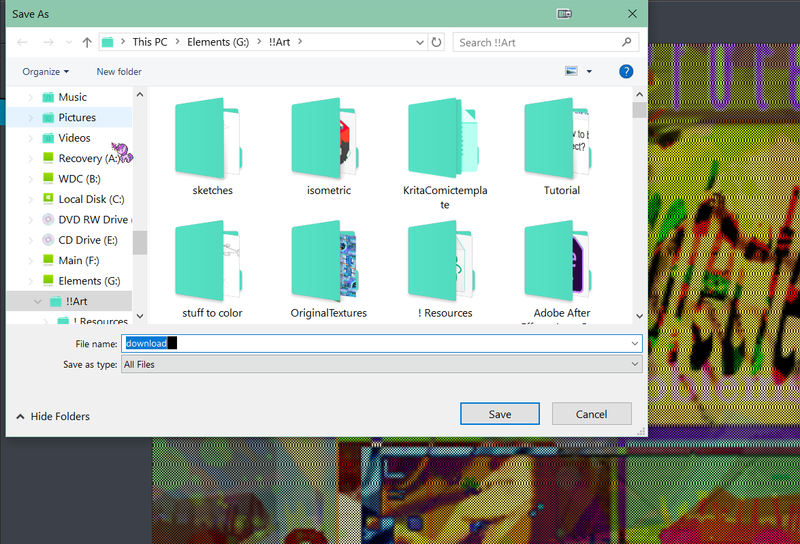 the drag and drop image interface also doesn't seem to work anymore. Oh, and some of the effects like dithering and scanlines only have a correct preview on 1:1 zoom. But this was also an issue in older versions. The C64 palette still needs a fix. It has one grey tone too many and no purple. Aside form that the tool works perfect. No color picker in this version since you can load any external palete colors to be used. The drag&drop image should work. Also clicking in the image two times place it to the center ¿?. Using zoom changes how the image looks because all the effects, palette and shaders are applied to the actual image dimesions. About th C64 mmm works correct to me ¿? What is the color needs to be added and which color needs to be removed ¿? Color picker would come in handy anyway. 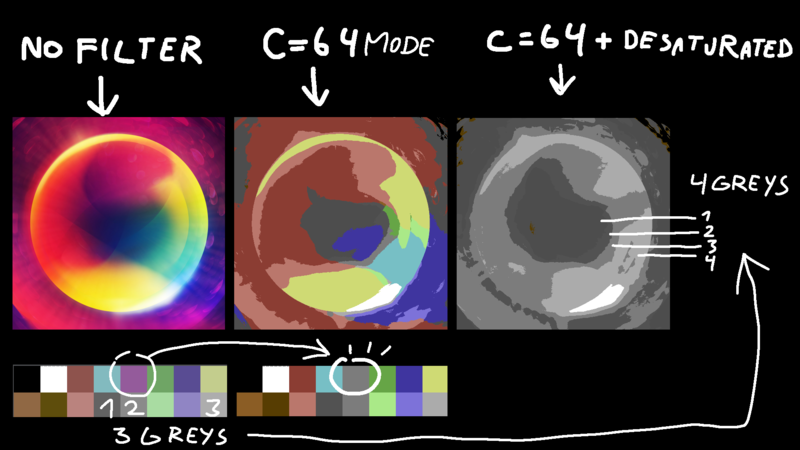 I sometimes need a pallete with exact colors from the image and now I have to tediously recreate them with color sliders. Hi, i uploaded a 1.56 version that should have the C64 palette fixed, let me know. Cool, but I got the tool with the asset pack bundle, can you upload it there as well? thanks! I know this has been asked before, but it would be really fantastic to get an "export at current resolution" option or something, just to save the extra step from having to go into Photoshop/etc and resize all the output! Just some suggestions! I love it as-is as well. Thanks for this tool! Go to Color and set Saturation to 0 so you will get that Black/White effects. Thank you! Is it the way how you convert images to 1bit art? Oh! You mean only 2 colors. Then go to palette tab and in the palette slider select the Black&White. Or in the palette slots in the top add the black and white color and press "set". Bought yesterday, love many of the features. Is there any way to preserve the alpha channel (ie blank brackground)? Only using 16 bits, with palette the alpha/transparency is lost. One trick is having this in mind prepare the image before use the tool so you can erase the color around easily. Ok, will work around it. One other question I have as I watch the tutorials, there looks like an earlier version had a "black outline" feature, I would love to be able to add an outline/border, is that something that still exists? Hi, do you think we could use the Matriax8c palette in our game? We would like to implement a palette swap option, and this would be one of the options. Sorry for asking here but I couldn't find a way to send a PM anywhere. You can message me @DavidKayConrad on Twitter. Hey! yes no problem!, as far as i know palettes not have copyright, or in my case my matriax8c and 128c not have. So go ahead. My twitter is @DavitMasia in case you have any more doubts.